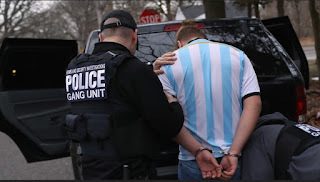 The U.S. Immigration and Customs Enforcement agency (ICE) has increased both its work site investigations and its immigration-related arrests in 2018 compared to the previous year. According to newly released federal data, the agency more than tripled its work site investigations and made over five times more immigration arrests than it did in 2017. The start of fiscal year 2018, October 1, 2017, saw ICE begin investigations at 6,093 workplaces, over three times the 1,716 during fiscal year 2017, which also included several months under former President Obama. Oh yeah. Let's make it harder for businesses, and let's rip up families for no good reason. Great idea.